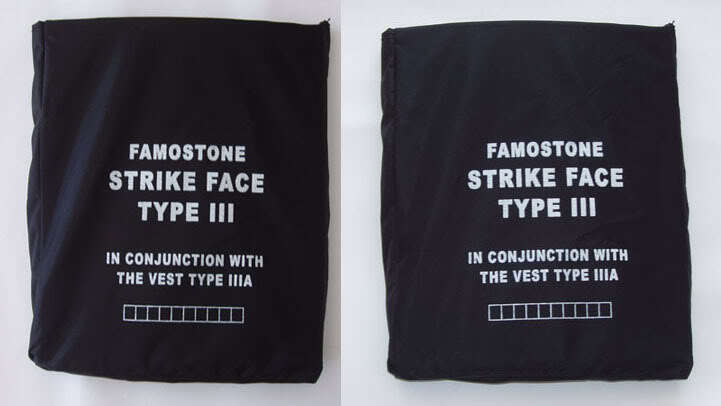 Famostone is an ultralight ballistic hard armor is lighter than any other material available in the world. The high strength Polyethylene fiber used has been shown to be 10 times stronger than steel thus making it the strongest and lightest fiber in the world. The material is waterproof and outperforms all other armor materials in stopping high velocity rounds. This will stop as many rounds as can fit on the plate and at 1.4kg each this is the undoubtedly the lightest plate around that offers such a high level of protection. In addition, this piece of Level III body armor comes with a 5 year manufacturer warranty. Making an investment in a product such as the Ceramic Plate Body Armor will have exceptional benefits for any buyer. Will fit ANY bulletproof vest that has front and/or back 10 by 12 inch sized pockets. Cermic Composite Plates to ADD protection above the Threat Level IIIA built into our vests to bring the coverage area up to Threat Level III. The National Institute of Justice (NIJ), which rates body armor based upon its effectiveness, places the Ceramic Plate Body Armor at one of the highest levels – a Level III. This armor is unique among the many types of body armor for sale because it is made with “Kevlar Fabric”. The combination of the body armor and this specially designed fabric stops bullets from penetrating and simultaneously helps to reduce the impact of blunt force on a person’s body. While some bullet proof vests may stop bullets from coming through the armor, this is oftentimes not enough, as people can still suffer extreme injuries from the force of the impact between the bullets and the armor. With the Ceramic Plate Body Armor, made with “Kevlar Fabric”, you will be receiving the best protection possible. The ceramic plate is made according to the highest of standards and will keep your body safe and protected. Because of the high level of care with which this item is made, the body armor has the ability to absorb 6 shots of 7.62 x 51 mm Nato ammo.